Tom Rollings is a PhD researcher whose work focuses on the intersection of linguistics and intellectual history in imperial Russia. In February, Tom attended the HaCKS workshop in York and he would like to share a summary and commentary about this event. After introductions over generously provided tea and biscuits, Johanna Blakey, a PhD student at Sheffield, kicked off with an overview of her research on dialect continuity and change in Sheffield. Johanna underlined that Sheffield has a history of dialectal research because of its marked social inequality. Johanna is looking to establish how factors such as deindustrialisation and the rise of service sector industries have impacted on the evolution of the local dialect. Since the Sheffield dialect was studied in the 1980s and 1990s, the speaker is looking to compare the evidence she gathers to that gathered by previous studies. During the discussion, Johanna clarified her growing interest in how attitudes, such as criticisms of the reconstruction of the city centre that left long-term residents disorientated, may serve as a marker for dialectical shift. In terms of indexicality, I found this talk fascinating because it highlighted how individuals respond to social change in their lifetime. Johanna’s research underscored how individual agency in Sheffield only makes sense in terms of wider regional shifts, but that these wider regional shifts can only be understood as a result of how people individually negotiate and renegotiate the pressures of social change. Keith Tse, who works in the linguistics department at York, spoke about the derivation of cleft constructions in Chinese dialects. As Keith explained, his talk was an attempt to utilise Chomsky’s minimalist programme in the study of sociolinguistic evidence. The Chinese data were tricky for us to follow because none of us apart from Keith had any knowledge of Chinese. However, the use of regional variation in the constructions that Keith presented was clear. Moreover, Keith clarified the difference in the origins of constructions that are now, in certain dialects, mixed up and used interchangeably. For me, what was most striking was Keith’s discussion of deixis. Although Keith did not look at individual variation as other speakers did, his comments on deixis echoed the analysis of Silverman on shifters back in the 1970s that the subsequent work of Penelope Eckert and others built on. While Eckert’s analysis of individual variation and performativity in language may challenge Chomsky’s universalist assumption, Keith’s focus on syntax may point to an aspect of variation in Chinese that existing studies of indexicality have not yet grappled with, so this may warrant further investigation. Dominic Watt, a faculty member of the linguistics department at York, spoke about aural evidence in the fight against crime, as well as elsewhere. One issue here is the training that the police and other law-enforcement agencies require in order to be able to elicit relevant information from witnesses who are not trained linguists. To this end, Dominic shared with us some the questionnaire template that the UK’s counter terrorism agency uses, for example in documenting the voice of callers who make bomb threats. In a really concrete manner Dominic’s talk clarified the issue of speech perception, which is a major topic in itself and crucial to wider research on indexicality. Salina Cuddy, a PhD student at York, introduced her research in the field of queer linguistics. In particular, she identified variation in the markedness of what she termed a “lesbian voice,” when speakers index their sexuality in certain situations more than others. Many members of the audience related to issues that Salina raised regarding her methodology and data collection, which foregrounded the need for researchers to reflect on the extent to which our own role and identity shapes the results that we gather. Amy Wearmouth, a Masters student at York St. John University, compared the lyrics and contexts in two songs by the hip-hop artist Nicki Minaj in order to trace how Minaj indexes her gender. I found Amy’s talk the most memorable of the day because for me it summed up the idea behind the series of workshops on indexicality in bringing together researchers from various angles. As Amy explained, her background is in English literature rather than linguistics. This goes a long way to explaining why she was the only speaker who used critical discourse analysis and who built their talk around the study of one individual. This made it possible to explore indexicality in ways that I had not considered previously. In addition to research on indexicality within local speech communities, there is value to studying celebrities too. The topic of fame is usually considered in connection with iconicity for good reason but iconicity does not explain how Nicki presented herself before she was famous, as in the first song (“Your Love”) that Amy analysed. Moreover, Nicki has been able to become so iconic because of the way that she has presented herself. Iconicity does not exclude indexicality but means that Nicki has had to index herself in relation to the iconic status that she has achieved. Finally, because of her influence, her fans can index themselves in relation to her (including other singers in their work, as Amy mentioned), so the reception of her artistic creativity could be a topic of research in its own right. The last speaker was Nathaniel Dziura, a PhD student at Sheffield, and the main organiser of HaCKS this year. Nathaniel spoke about his research that seeks to uncover how migrant Polish and LGBTQ+ identities intersect in Sheffield. My interest in Nathaniel’s work is shaped both by my lengthy experience of teaching English in Russia and by my knowledge of Polish migrants in Sheffield. I completely agree with Nat’s questioning of the commonly held assumption that learners of English as a second language first acquire the standard language and only when they have mastered a sufficient level of proficiency acquire an active knowledge of dialectal variation. In my personal experience, this is often largely a result of the way that textbooks privilege the standard language in English L2 instruction. In terms of how migrant Poles relate to local identities once in the UK though, this could be subject to significant evolution during the course of Nat’s data collection. In my experience, young Poles I have met (who weren’t LGBTQ+) identified very strongly with the UK, so it may not be the case that LGBTQ+ speakers demonstrate any greater degree of positive attitude to the UK. But I have also been struck by cases of linguistic discrimination against Poles, which may trigger them to feel disillusioned with the UK, especially given the current political climate. Although it is not feasible within Nat’s current study, I have a final thought informed by my experience of teaching that Nat’s presentation has raised. Given that he plans to hold extensive group discussions with his Polish LGBTQ+ migrant respondents, it would be very interesting for future research to incorporate some language instruction into such a methodology, and to compare how the positive group environment established during data collection influences language learning – for example, would learners focus more on learning slang and the Sheffield dialect, as opposed to formal, standard British English, as the latter might be less relevant to the group. Overall, having missed the first workshop because I was away, I was really glad that I was able to attend this event and benefit from the enthusiastic presenters and stimulating exchange of ideas and research experiences. 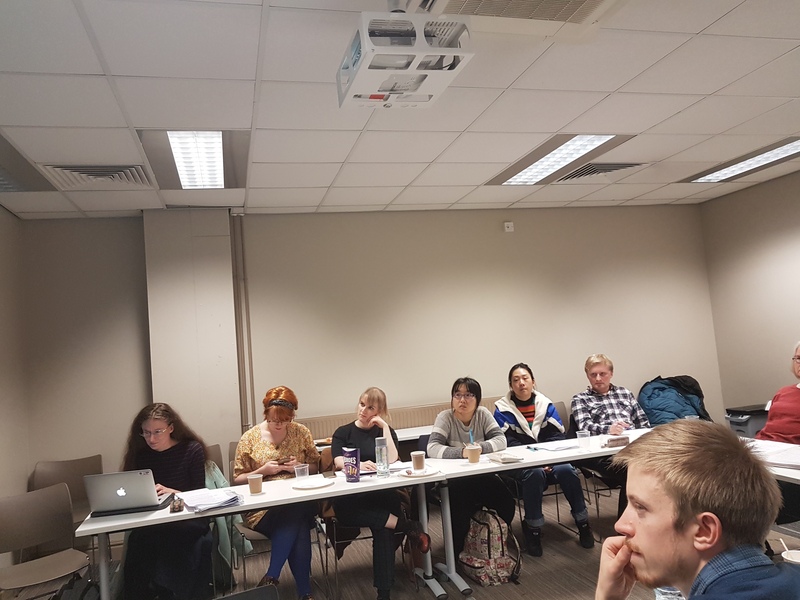 If you want to read more thoughts from attendees of this workshop, click here to read one of our speakers Keith Tse‘s Medium article about his work on reconciling the (seemingly) incompatible positions between formal syntax and sociolinguistics. Johanna Blakey is a PhD researcher at the University of Sheffield whose work explores continuity and change in the Sheffield dialect. Having attended the HaCKS workshop that was recently held in Sheffield, she would like to report her experiences from the event, with a particular focus on the talks relevant to her project. Our first talk was delivered by Emily Reed, who delivered an interesting examination of pronominal address in 14th century Anglo-Norman French, with comparisons to Middle English. Emily demonstrated the application of 1st 2nd and 3rd orders of indexicality according to Rene Van Compermolle (2011) to explore social meaning in the use of ‘Tu’ and ‘Vous’ forms beyond the binary meanings which are imposed upon double-indexical Modern French. 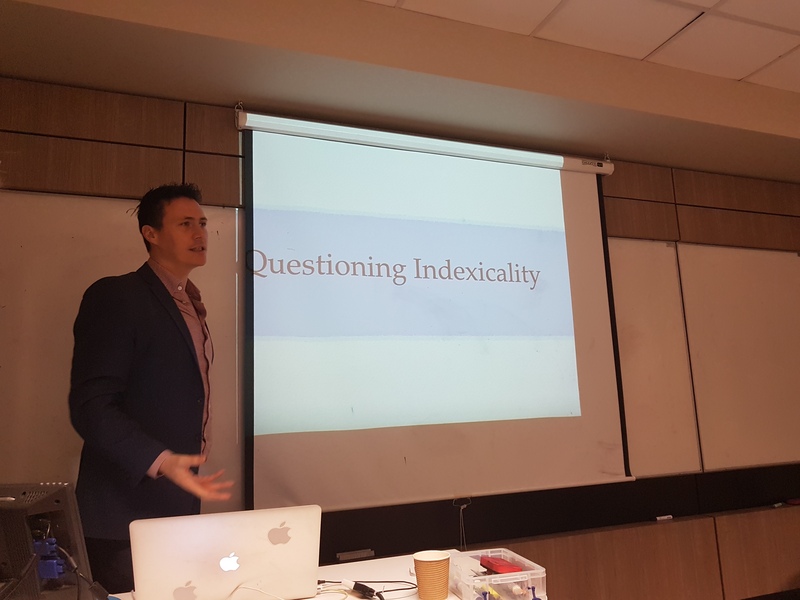 This demonstrated that there is applicability of the concept of indexicality to research in historical linguistics, albeit with some caveats, which were also further explored in the following talk. The second talk of the workshop was delivered by historical linguist Christine Wallis, who presented us with an interesting examination of the challenges of adopting the concept of indexicality in her own work, which focuses on the role of the scribes in producing and correcting medieval manuscripts. She pointed out the difficulty that comes with the lack of knowledge about a scribe’s motivation in making corrections, as well as a lack of ownership construed in the manuscripts, which inhibits our ability to reconstruct social meaning from such sources. 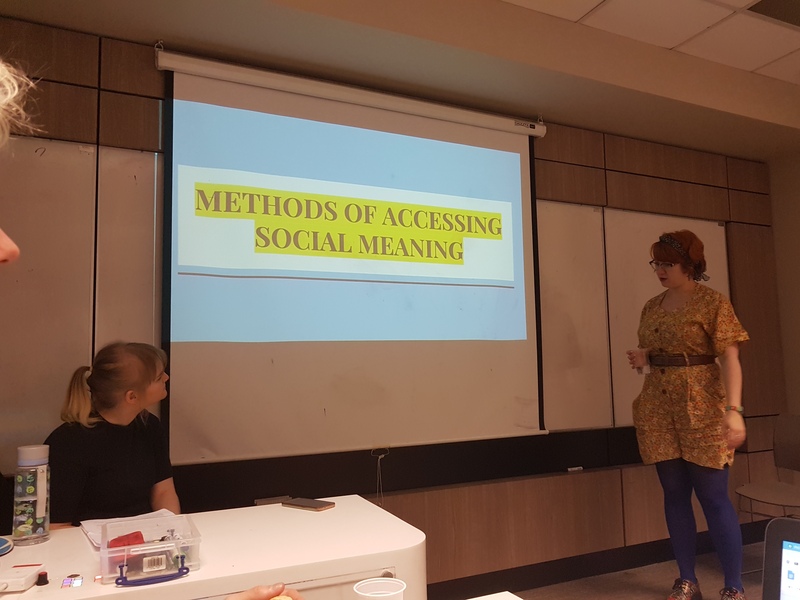 Thirdly, and of most interest to myself, was a joint talk by sociolinguists Hannah Leach and Holly Dann, focusing on ‘Alternative Methods of Accessing Social Meaning’. 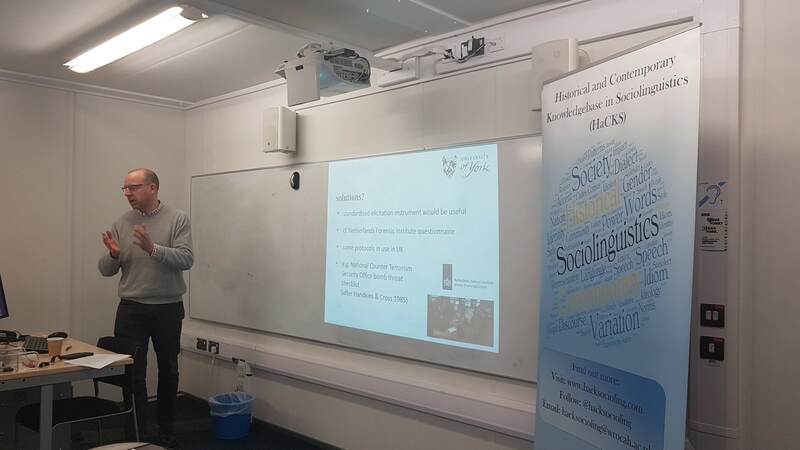 The talk began with an exploration of previous conventional methods of studying social meaning in sociolinguistic research, which include Ethnographic studies, Identity Questionnaires and Perception research. 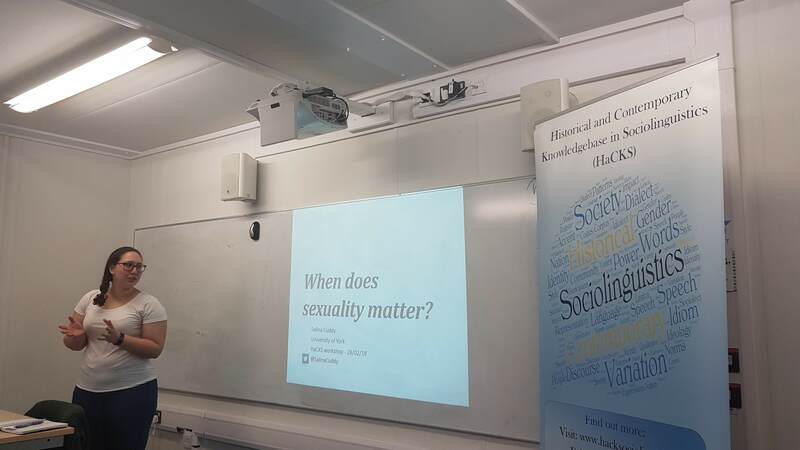 In acknowledging that it is not always practical or possible to carry out in depth ethnographic methodologies (which have been considered to be imperative in understanding local context and meaning in sociolinguistic research), Holly and Hannah then took it in turns to explain what this meant for their own PhD research. Both researchers saw it fitting to adopt less conventional methodologies and adapt their research methods in ways that allowed them to explore the indexicality of particular phonetic variables in the speech of participants in their home speech communities in substitution of ethnography. Hannah took us through her research in Stoke-on-Trent, focusing on the social hierarchy of the Pottery industry and examining how belonging to particular departments has the potential to impact upon the linguistic variants that the participants produce. She presented evidence that speakers within an oral history archive in a Stoke Pottery Museum display linguistic variation which is dependant upon their role in the industry, and also that this linguistic behaviour can change according to topic shift. As the speakers in her sample are no longer alive for Hannah to revisit and carry out ethnography, she instead carried out a socio-cultural investigation of the Pottery Industry. This lead her to divide the sample by departments and look at the interactions between these departments as the analysis demonstrated that these categories are significant to the speakers. This demonstrates that, when an ethnography is not possible because the opportunity has been lost to time, it is possible to gain in-depth socio-cultural information by taking a socio-historical approach to understanding the local context by revisiting archives and revealing the necessary information. Holly carried out research in Cornwall which focuses on the indexicality of phonetic variants (TRAP and BATH vowels) in 12 year old school children. Her distance from the speech community as a result of studying in the North of England meant that her contact with the speech community was limited and the ethnographic approach was beyond reach. Holly instead utilised experimental methods in investigating both the production and perception of her participants speech, which allowed her to explore the social meanings that her participants attach to certain linguistic forms. She was able to suggest that young speakers in her study are using shortened versions of the BATH and TRAP vowels, but this is not because they are conforming to wider standardisation and being influenced by Standard English as we might expect. They are instead innovating a new form, which is indexical of a Contemporary Cornish identity, but separate from the traditional Cornish identity of a ‘rural farmer’ which is associated with the longer and stigmatised vowel forms. The pairing of production and perception methods allows us to carry out this type of analysis and, in Holly’s case, finding out about how youngsters perceive their local area and align with the concept of place aided her in establishing how their linguistic behaviour is utilised in performances of local identity. Holly and Hannah’s research both show how we can use the concept of indexicality in sociolinguistic research to explore local identity, as speakers can be seen to utilize linguistic behaviour in performances of identity in local contexts. This talk encouraged me to think more about the concept of indexicality, and how I might utilize this in my own sociolinguistic PhD research project. I am studying Dialect Continuity and Change in Sheffield by utilizing a Real and Apparent Time trend study approach. This will consist of comparing archival dialect recordings with contemporary recordings to carry out a socio-phonetic analysis of sound change. The concept of indexicality could be useful in my own research when it comes to explaining why these changes happen and why individual speakers might conform to or avoid community wide trends to communicate particular social meanings. Our next talk was by Paul O’Neill who questioned the concept of indexicality in linguistics. He pointed out that specific lexical items can have a broad range of meanings as there is ambiguity in variation, and therefore adopted theories from disciplines outside of linguistics, including cognitive psychology and sociology, to emphasise the importance of reading outside of our own fields to subsidise work in social meaning. He promotes the idea of symbolism, first theorised by Deacon (1997), as well as prototype theory in the study of linguistic meaning, as there is combinatorial complexitivity in language, which he claims linguistics often simplifies with the use of the concept of indexicality. 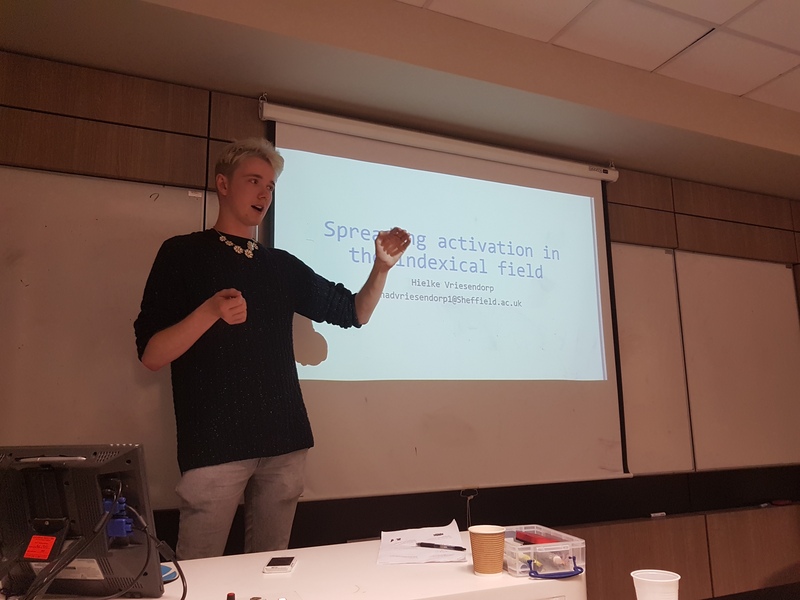 Our penultimate talk in the field of psycholinguistics was by Hielke Vriesendorp, who demonstrates how priming experiments can help us to understand how activation is spread in the indexical field. Hielke is carrying out exciting new research which aims to further our understanding of how accents are recognised below awareness, and presented to us findings of his pilot study which shows evidence that accent labels have the potential to prime related concepts both positively and negatively. He is able to demonstrate that semantic activation can be measured through priming, which shows that, cognitively, certain lexical items can be indexical of other concepts. This is something which he aims to further explore by presenting auditory cues to see whether hearing an accent or a particular phonetic feature can have the same effect. Our final talk was from Svetlana Sokolova who expanded on the prior talks relating to cognitive linguistics and explored how indexicality might contribute to cognitive linguistics and vice versa. Her article is not directly about indexicality, but could be reinterpreted to some extent in connection with it. She suggested that indexicality can offer a more integrated approach to cognitive linguistics and help us better understand cognitive mechanisms. These talks then paved the way for a stimulating discussion between speakers and attendees about the applications of indexicality across the various sub-disciplines in linguistics which rounded off a brilliant day and an excellent start to HaCKS for this academic year. Thank you, Johanna, for this account of our event! Please check out Johanna’s blog and twitter to hear more about her research! As some of you may be aware, HaCKS’ original incarnation ran in the academic year 2015-2016. 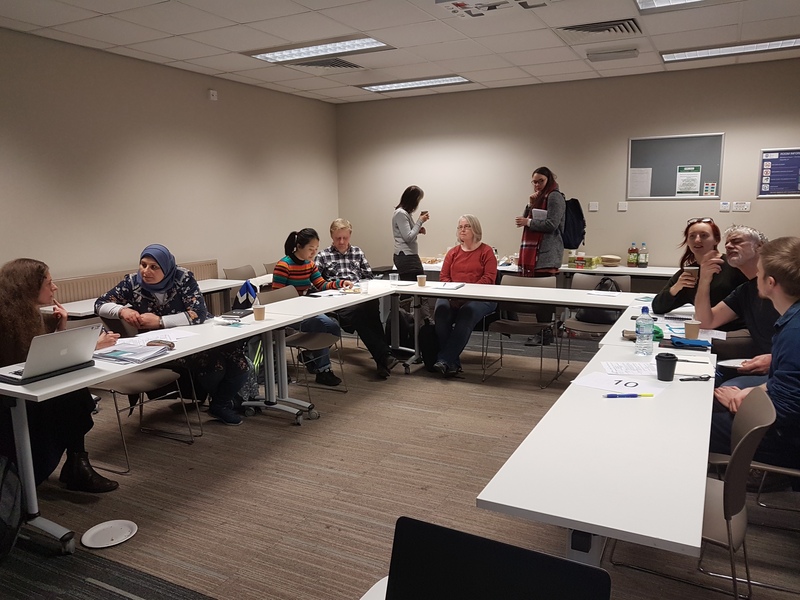 The project’s aim was to provide a knowledgebase for researchers in sociolinguistics via this blog, and run a seminar series to showcase current research. The project ran with great success and now, after some restructuring of the original format, HaCKS is back! We all share an interest in sociolinguistics and language variation and therefore want to continue expanding on HaCKS’ original foundations. This year, we will run a programme of workshops and, in addition, will use the blog to continue discussion beyond the topics covered during our events. Our focus for this year’s events is the theory of indexicality. Specifically, we are interested in whether this term is under-theorised in research on language variation. For a more detailed outline of HaCKS’ aims please see here. We are pleased to report that we have secured WRoCAH funding to run 3 events this academic year (2018-2019)! Each event will be hosted at a different WRoCAH university; The first will happen in the second week of December 2018 in Sheffield, the second in February 2019 in York, and the third will be in April, 2019 hopefully in Leeds (actual dates TBC). Each event will be about 4.5 hours long including lunch (which will be provided!). Our aim is for these sessions to be more conversational than lectures, so each talk will be followed by 10-15 minutes of discussion and there will be a larger discussion at the end of each event. We will be able to cover your costs for travelling to the events. The events would be excellent networking opportunities! They are primarily aimed at PGRs and ECRs but some of our talks will also be by full time lecturers. If you are interested in attending any of our events, we strongly suggest you register your attendance in advance through Eventbrite, so we are aware of attendance numbers (a link to registration will be posted soon). We will be posting more information and proper schedules for the events closer to the time, so stay tuned! In the meantime, we will also be posting to our blog. Please do leave your comments and start up discussions about language and society – we want to get the conversation flowing! One of the most important functions of language is that it allows us to manage our presentation of self and our identities. In the same way that we can, for example, utilise different items of clothing in order to create unique presentations of self, we can also employ a whole range of linguistic resources. Whereas early quantitative sociolinguistic studies, such as Labov (1966) or Trudgill (1974) understood a speaker’s sociodemographic characteristics (i.e. their gender, age, socioeconomic class or ethnicity) to be the cause of their linguistic practice, contemporary research understands language practice to be constitutive of our social identities. This means that rather than presuming that because I am a woman I will speak in a certain way; we can say that I am perceived to be a woman (in part) due to the way I speak (Cameron 1997). This understanding of the relationship between language and social identities is in keeping with Judith Butler’s (1990) influential theorising about the nature of gender. Butler (1990) argues that there is nothing behind the expression of gender identities other than the performative enactment of such identities. This has led scholars in sociolinguistics, such as Bucholtz and Hall (2005) to suggest that identities are the emergent products of interactions, something which we construct using linguistic and non-linguistic social practices. The Sociolinguistics Symposia are the world’s largest gatherings of researchers in the field of sociolinguistics and hub to the latest advances in sociolinguistic research. Started in 1976 as a meeting to address the scarcity of sociolinguistic research in the UK, the Sociolinguistics Symposia have now flourished into an international affair as one of the most important events on any sociolinguist’s calendar. Having attended now my first Sociolinguistics Symposium (SS21) at the University of Murcia just recently, this blog post aims to give practical advice about how to get the most out of (or HaCK, if you excuse the pun) attending a Sociolinguistics Symposium as a young researcher or a newbie to the conference world. 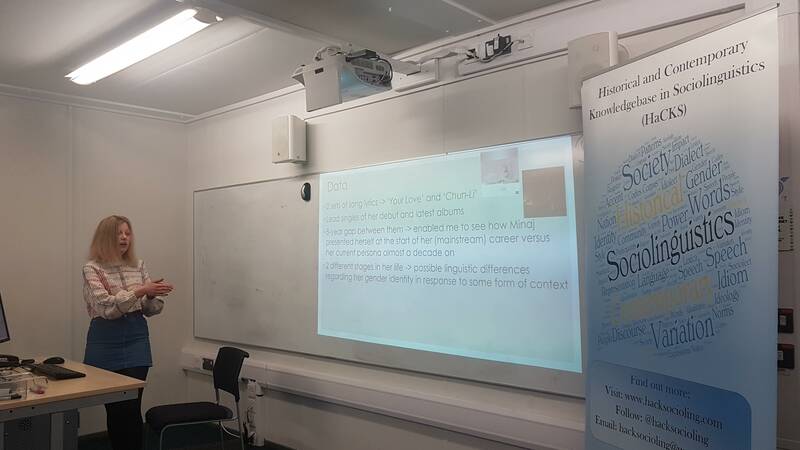 Following on from a wonderful guest lecture by Dr Diana Cullell in York last week as part of our Seminar Series, where she outlined some of the intricacies of negotiating linguistic identities when translating Catalan poetry, I wanted to continue the theme of sociolinguistics in literary contexts. As such, in this post I will outline some of the arguments I presented last year for a Masters essay on Tierno Monénembo’s (1995) novel Pelourinho. Diversity is a naturally occurring phenomenon throughout all of life, including language. Despite this everyone has their own idea of what is “correct” when it comes to speech, with some dialects and accents considered “better” than others. Even those who have been specifically taught otherwise can find it difficult not to make an instant judgment about a person solely on the basis of how they speak (Lippi-Green, 1994; Milroy & Milroy, 1991). It is in these moments, when snap judgments are made and not examined or discarded, that accent discrimination can arise. For many people, the terms accent and dialect do not mean anything more than how someone who is other and different speaks. In fact, many people believe they themselves do not even have an accent (Morley, 1996), something linguists refer to as “the non-accent myth” (Cho, 2010). The word accent itself was originally a Latin translation of the Greek word “prosiodia,” (Vaissiere & Boula De Mareuil, 2004) which was used to differentiate between people who spoke “correctly” and those who did not (Oed.com, 2015). This seems to imply that approaching accents as something that is other is not a new view and has in fact been the prominent language ideology for millennia.